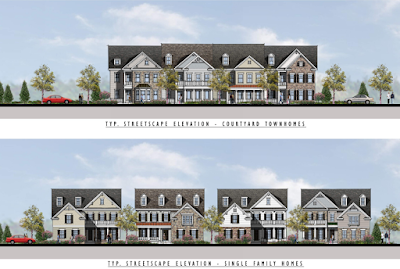 Montgomery County took one more slouch towards becoming the world's largest bedroom community last night, with the Rockville Planning Commission's recommendation to the Mayor and Council that land designated for office space in Tower Oaks be converted to residential. Commissioners voted 4-2 to approve developer EYA's project plan amendment that would allow 375 housing units, including four multifamily buildings, townhomes and single-family homes, on the east side of Preserve Parkway. The project plan will now go the Mayor and Council for approval. Staff presented the commission with 9 binding elements required for approval, and commissioners voted unanimously to add 2 more - a shuttle to take residents to Metro and nearby shopping centers, and to make a proposed market a binding agreement. Aakash Thakkar, Senior VP of Acquisition and Development for EYA, described the market as being a "general store," where residents and their guests could purchase items like wine, cheese or a loaf of bread. Commissioner David Hill suggested making it a binding element, due to the absence of any grocery stores within easy walking distance of the site. EYA readily agreed to the addition, as well as the shuttle. The project would wipe out two-thirds of the forested property, and preserve one-third. Thakkar said EYA plans to leave that forest in its natural state, and perhaps add a wood-chip path that would meander through it. He said EYA would be willing to sign an agreement that would ensure the remaining forest was never developed. The development will also include a clubhouse with swimming pool and patio, several pocket parks, and a nature trail with exercise circuit. Commissioners expressed many misgivings about the proposal, but ultimately seemed to side with short-term real estate market realities over long-term ideals. Thakkar said the development would target a similar demographic to that of the nearby Park Potomac, empty nesters. There would certainly be children, he said, but the lack of transit, dining and nightlife on-site would not appeal as much to millennials. He suggested that up to 20% of future residents might be current employees in the nearby office developments. The project was also supported by several adjacent office park owners. Chair Charles Littlefield was among the most skeptical of the project, although he stressed that it had many strong points. "This is not smart growth," he concluded, based on the distance of the site from Metro and the proposed density. Thakkar noted that the density is lower than that of the developer's other projects, such as Park Potomac. The trendy thinking in the County is that the office market is weak away from Metro, and will be in perpetuity. This is not accurate, however. Wheaton has a Metro station, and its office market is terrible. 4500 East-West Highway and 7550 Wisconsin, both a short walk from the Bethesda Metro, have had to lower expectations and lease to smaller tenants than expected. 4500 lost the bidding for Intelsat headquarters to Tysons. How bad is it? One of the largest office buildings within walking distance of the Wheaton Metro station was just demolished to make way for - guess what? - housing. In reality, the office market is weak because Montgomery County's private sector economy is moribund, and its business climate is one of the worst in the region. The County hasn't attracted a single major corporate headquarters in nearly two decades. Not a single County Council member was endorsed by any Chamber of Commerce in the County in the 2014 election, a damning indictment of the anti-business record of the Council. As long as we continue to ignore that elephant in the room, we will never restore the office market. And you know what? Developers and landowners are largely fine with that. That's because the profits that can be realized from residential are far bigger than they will ever be from any office park or building. So while there may be crocodile tears and renting of garments publicly over the weak office market, behind the scenes, developers are rubbing their hands together at the prospect of every office building and office park in Montgomery County being converted to residential. Of course, that assumes that developers can continue to fill multifamily mid/high-rises with less-than-traditional suburban residents: heavily-subsidized millennials, contract and military housing, student housing, and the poor and homeless. That will not be so much the case in this Tower Oaks development, and several commissioners said they liked the home ownership and MPDU ownership opportunities the EYA project would provide. But Littlefield was right on the money when he argued that "residential demand is not infinite." And equally so when he noted that "it's supposed to be the 'I-270 Tech Corridor,' not the I-270 residential corridor." Whiile this project alone will not hurt much by itself, the flipping of office-to-residential is going to damage the City and County in the long-term. The loss of jobs and potential jobs, the incomes they provide compared to the retail/restaurant positions that replace them, and the impact on schools and roads are mounting by the day. What happens if we one day have a pro-business County Council, and large corporate headquarters and government agencies like the FBI were being considered here? Where would they go? The land space would be gone. "The County hasn't attracted a single major corporate headquarters in nearly two decades." 8:33: Choice was already here - they moved over from Silver Spring. Choice Hotels is certainly good to have. Maybe it's a slight exaggeration but we generally have an anti-business climate in MD. If you look at the total number of headquarters established in the DMV, the lion's share goes to VA. But they deserve it, they know how to attract businesses and make them stay. MD lives in some alternate reality, where they think residential construction, retail and restaurants are all that an economy needs. Rockville in particular is under some delusion that this is still a small town (hasn't been for probably 50 years, have they not noticed the traffic, home prices and noise levels?!) and is resistant to any form of urbanization. Time to embrace the realities. This is, as it appears you are aware, a City of Rockville development, thus why are you comparing the master planned goals of this (independent) government agency with one you despise? Rockville is providing a housing element it sorely neglected for more than twenty-five years, until the development of its farm communities, which are now fully-functional. Your beef with the county's governance, along with the continual use of the f*cking term "MORIBUND", really make you look like an imbecile. 10:24: No, it just makes sound smart for having an argument that is backed up by the data, rather than parroting the talking points of the MoCo political cartel. Rockville was lacking in housing? A satellite view of the City would quickly disprove that argument. Crowded schools and roads suggest we have provided the infrastructure for what we have, much less further growth. I can easily compare Rockville to MoCo on the conversion of office to residential. Just drive by the residential construction underway in the King Farm "business district." Once again you make no sense in your "moribund" arguments. Rockville neighborhoods developed in a circular pattern from the original core to the last sector in the early seventies known as New Mark Commons. After that it has been mostly in-fill development until the city limits expanded and acquired new areas, including King and Thomas farms. During that mid period no new housing was added. Muli-family housing in particular was absent, thus LOWERING the scool-age population considerably. With the expanded limits new housing was added that fostered, and will assist in perpetuating a cyclical housing market. School crowding is a condition bought on by the MCPS boundary drawing methodology not Rockville planning. Rockville has a adequate facilities policy which assist in facility management as development occurs just like MoCo. And the King Farm conversion of office to residential is demand based, or as you so repetitiously refer to as "MORIBUND" office market. There is a relational phrase in planning and development of producers and attractors that you never seem to get. I'm sorry, but just because a couple of transit accessible areas are also having trouble with their office market does not mean non-transit accessible areas would do well with office if the market were better. Frankly it's not really about transit or not, but it is about being in an urban or pseudo-urban environment or not. Right now Tower Oaks is four large, totally disjoined office buildings, surrounded by a bunch of trees, plus Clydes and a couple of flex buildings. There's absolutely nothing to walk to except in circles in the woods. I don't know of anywhere in the DMV where this type of office park is still successful - including Virginia's Fairfiew Park which was the golden child of office parks for so long, that is now having it's own vacancy issues. Even in Virginia's stronger employment market they are still suffering 20+% vacancy in their huge office parks, but continue to attract (often poach from themselves) office users to areas with Metro access. Virginia also is constantly reviewing plan amendments to convert office space to residential. Regional employment is growing, filling in the millions of square feet of empty space, plus the spec built space in DC and Tysons. Create jobs and you need to create households. The only other option is everyone keeps moving further and further out into Frederick, Carroll, Washington Counties - and if you try to argue that is sustainable or preferable then I've lost any and all credibility for your ideas. Even locally, hell, right across 270 in Park Potomac, things are doing better, because at least there are a couple more restaurants, a grocery store and the promise of more stuff to come, creating a pseudo-urban environment. Tower Oaks was planned to be harmonious with nature back when planners thought that meant towers in the trees. I don't think the office market would ever return to a place like Tower Oaks and you'd much sooner see Kings Farm, Park Potomac, White Flint and Rockville TC finish off their office approvals first. Nevermind the office space planned for and/or approved in Bethesda, Gaithersburg at Watkins Mill, Germantown... The county is in no danger of running out of space for possible office development if the market were to return, and if it did, guess what, we'd need even MORE housing to be built too. Gull, I don't totally disagree with what you are saying - for example, I think Marriott would probably be better off at Pike & Rose than at Tower Oaks. My concern is about the companies we know prefer or require a suburban campus setting. For a law enforcement, defense or intelligence use, secure perimeters are critical. For aerospace and larger biotechnology firms, lab space and facilities take up significant space. Many of the top companies - Facebook, Google, Apple, Ford, Fortune 500 defense firms - continue to thrive in isolated, suburban office campus settings. I personally like the green suburban office park setting at Rockledge, and along the I-270 corridor. Especially when there is free parking. It creates a pleasant setting whether you are going to work, or visiting an office. Green space is usually a prominent feature. In fact, the thing that strikes me whenever I go to Tower Oaks is the forested setting. When that's gone, I think they've lost a selling point. It's just like executive boulevard at that point. I don't think developers are the villains on this particular issue - it's the business climate that has to change. I want to be sure we have room for the campus-style headquarters when it does. You may prefer the campus style development, and there are others who do, but on a whole, the market, or at least those who decide the market, have made a clear shift to the contrary. My only complaint about the urban environments office spaces (without security concerns) are moving to is the token open space provided is too small, and we would be better off pooling resources to provide one or two large green areas that provide the green relief, rather than a dozen tiny pocket parks. I think there are enough mostly empty and/or approved unbuilt office spaces along the 270 corridor to accommodate the needs of cyber security firms or anyone looking for a more suburban environment. I believe there's still one development pad left for an office building at Kings Farm that was not converted over to residential, there's still an office building parcel left on the southern side of Washingtonian south, and 300,000 sq ft of developable office space was left for Washingtonian North. There's also 3 more stand-alone office buildings that can go in the southeast quadrant of future I-270 at Watkins Mill Rd, and campus style development opportunities left as part of Cabin Branch in Clarksburg and Montgomery College Germantown. The same area of Tower Oaks being approved for housing now could have been cleared for office development so the forest was never 'planned' to be saved. My concern with the development style of Tower Oaks is it fragments the forest resources, leaving them vulnerable to invasive plants and storm damage. Thank you Robert for sharing this information since I did not view the Rockville Planning Commission meeting when this development project was presented. It sounds like it will be another nice development like King Farm and Fallsgrove. Many residents weren't happy about those developments at first. However, people live there and they keep coming. 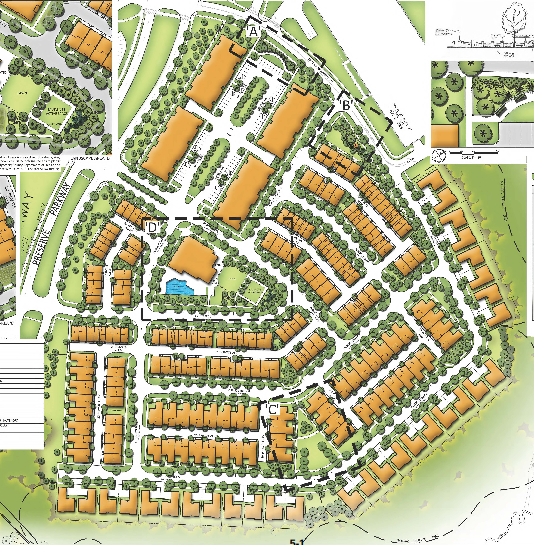 I like the idea of having a shuttle for the Tower Oaks community like King Farm had in their development agreement. Rockville is a growing community. It is nice that developers are willing to invest their money in Rockville. There are many communities that wish a developer would invest in their town. Generally agree that this project is not smart growth. Still, some major inaccuracies in this piece. "The trendy thinking in the County is that the office market is weak away from Metro, and will be in perpetuity. This is not accurate, however. Wheaton has a Metro station, and its office market is terrible. 4500 East-West Highway and 7550 Wisconsin, both a short walk from the Bethesda Metro, have had to lower expectations and lease to smaller tenants than expected. 4500 lost the bidding for Intelsat headquarters to Tysons." The office market is weak everywhere in the county. It just happens to be weaker in suburban office parks. Wheaton is a poor example example, since it never was much of an office market to begin with - <1 mil. SF - and has to contend with DTSS. Obsolete office-to-residential conversions are happening everywhere here, Baltimore to Crystal City. Don't let Tysons fool you. The Silver Line is just sucking up the demand from the traditional car-oriented office parks. Believe me Northern Virginia has far more empty office buildings than Suburban MD and a higher overall vacancy rate. Rosslyn - the crown jewel - has a brand-new office building - DC Metro's tallest - that's been sitting empty for nearly three years. The downtown Bethesda submarket is one of the region's tightest right now. 4500 East-West Hwy. and 7550 Wisconsin Ave. are fully leased. The latter just sold for a record price/SF. I can assure you that would never happen in truly "moribund" market conditions. General consensus among CRE execs is that the county's next office property will be in Bethesda. Probably by JBG. Up the Pike, Federal Realty's Office building at Pike & Rose is fully leased, mostly to tenants who moved from traditional office parks and were willing to pay higher rent. As for corporate headquarters, the county just recently got Donohoe to move to downtown Bethesda from DC. Takeaway: The office market is pretty bad, but its recovering. Mixed-use transit-oriented product is leading the way in DC, Montgomery, Virginia, and pretty much everywhere in the country. The regional economy is robust. Honestly Montgomery County is better positioned in a lot of ways than Virginia. The science-research-tech cluster is really booming. We were told by the County Council that White Flint would be our Tysons...full of jobs and corporate headquarters. It simply hasn't happened. I love the restaurants at Pike & Rose... just don't call it Tysons. White Flint can never be exactly what Tyson's is, because Tysons has the convergence of 3 freeways and is geographically huge. I also don't want White Flint to be what Tysons is, or may become because I don't see Tysons as ever coming a true urban area. It will instead be 4 or 5 mini-cities, each clustered on their side of Rt 7 or Rt 123. It'll be dense, but it will also be more auto-centric and less human scale. Problem is what makes it slightly less appealing to residents makes it slightly more appealing to businesses. 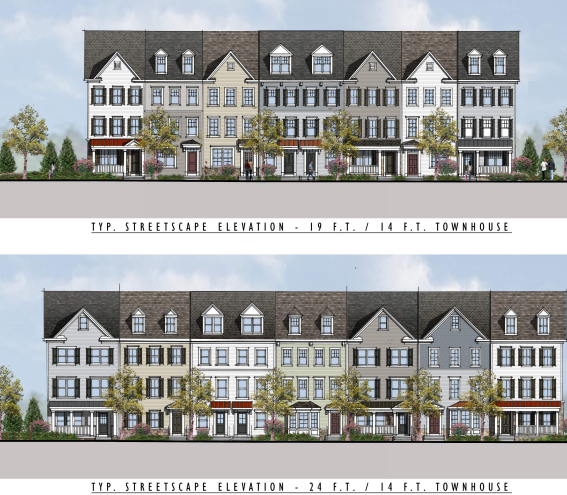 Another 1,000 new Rockville residents (375 residential units times 2.6 people per unit) and the developer NOT paying anywhere near its fair share on the impact the development will make on schools, roads, police, fire/rescue, storm water management, etc. This burden will again be shouldered by current residents. It’s why your Montgomery County property taxes are going up and why your Rockville fees (like the “rain tax”/storm water management) are going up, which will result in an additional $500 per year in taxes and fees. This trend is not sustainable. An why does it happen? Montgomery County politicians such as Leggett, Leventhal, Floreen, Riemer, Katz, Rice, etc. take between 60% to 75% of their campaign dollars from developers and then enact developer friendly policies.